Is This The Best Snow Blower For You? This is Craftsman’s biggest practical snow thrower for 2013! At first look it appears just like the Cub Cadet 33 in snow throwers but there are some subtle differences. The Craftsman 88397 is $500 cheaper, has drift cutters, sealed, maintenance free ball bearings, stronger than steel poly skid shoes and is serviced right at your home by Sears Home Services. You never have to take your Craftsman anywhere to get it repaired . This Craftsman is designed for anyone that needs to clean a very large driveway or large, wide sidewalks. This snow thrower features heated hand grips, huge capacity, large deep tread tires, big motor, power steering and electric start. It handles not only the heavy, wet snow on your driveway but also clear the piles of snow left by your snow plow or ATV. I also recommend this snow thrower to municipalities and owners who have large areas and large snow falls to deal with. Sears has the best parts network. If you ever need parts you can quickly order them through searspartsdirect.com. 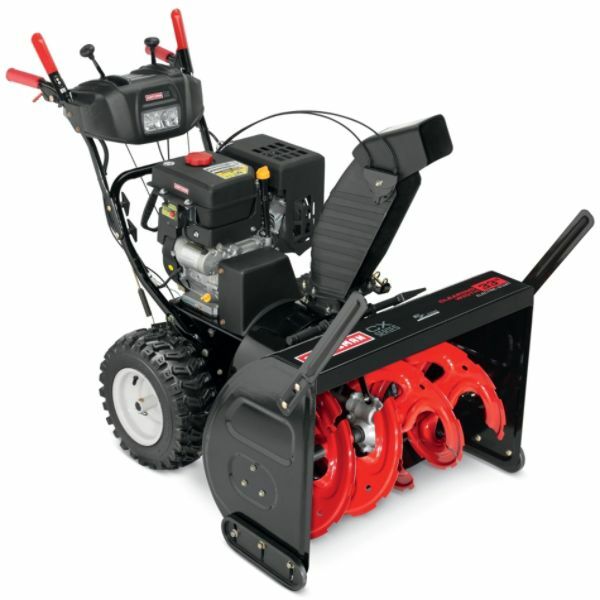 Keep a set of belts, skid shoes and shear pins in your shop and this snow blower won’t let you down! It works best for large areas like parking lots, city sidewalks, school sidewalks and three car driveways. Even though it weighs almost 400 lbs it is very easy to maneuver and use. WHAT SIZE DRIVEWAY WILL YOU BE CLEARING? (Small, Medium, Large, Extra Large) This snow thrower is large enough to handle any size of driveway, parking lot or sidewalk complex. There is no higher capacity walk-behind snow blower on the market. It is not as heavy-duty as the Ariens Professional Series 36 in. Two-Stage Electric Start Gas Snow Blower (926040) buy it is also $1000 less. WHAT TYPE OF SNOW DO YOU TYPICALLY GET? (Powdery, Light, Moderate, Wet & Heavy.) This is Craftsman’s best large capacity snow thrower. It will handle all types of snow well. WHAT TYPE OF SURFACE WILL YOU BE CLEARING? (Paved, Gravel, Patio, Deck, Turf.) The Craftsman CX Series 33 in 357cc Dual-Stage Snowblower w/ EZ Steer 16″ x 6.5″ X-Trac has Polymere rust-resistant, non-marking, reversible skid shoes. These non-marring shoes are the tougher than steel, yet they won’t scratch your patio or leave brown rust marks on your cement sidewalks and driveways. If you do manage to wear them out they are reversible to give your double the life over steel skid shoes. HOW MUCH SNOW DO YOU NEED TO CLEAR PER SNOWFALL? (Less than 3″, 3″-6″, 6″-9″, More than 9″) The 22 inch intake height will let you power through most drifts. Tool-less drift cutters let you cut cleanly through deeper drifts. This snow thrower will handle 20 inch snow falls easily. The 16 inch impeller is the largest currently on the market. What you can use this snow blower for:For Paved and Gravel surfaces. (Because of it’s size you may have traction issues using it on unfrozen gravel) Moderate to wet and heavy snowfall. Because it has larger tires than most of the other snow throwers you can go out in the back yard and easily clean a spot off for your dogs. This snow blower will easily handle 20 inch and deeper snow falls. It will handle even deeper snow falls if you get blizzards often. The six forward and two reverse speeds will let you go slow for the heavy stuff and faster for the lighter snows. What you may not like: This snowblower is big and heavy! Even though it is a big snow thrower it is very easy to use and balanced well, but it will not work well for you if you have to go over more than a step or two. Sears is the Official On-Line Retailer: This snow blower is sold through Sears and Sears Hometown stores only. Click Here To See Current Price, Order Online, Pick Up at your local Sears, or have it delivered to your home: Be sure to click on the “Special Offers” tab to see the online only specials! Be Careful! You may find “factory-direct discount” stores trying to sell this snow blower but make sure they are an authorized Sears Retailer. Make sure the “factory-direct discount” store won’t leave you “out in the cold” when it comes to service. Sears gets your snow blower serviced quickly at your home if there is a warranty issue. Is This One Of The Best Rated Snow Blowers for 2013? Mechanically this snow thrower is rated well and has no maintenance issues. It has been around for a few years now and the only real changes to it have been engines and paint schemes. If you need to clear large areas like city sidewalks, school walkways or huge, flat residential driveways don’t be afraid to buy this machine. The engine is 4 years old and is developing one of the best service records around. It has six shear pins in the auger so if you do hit something they break instead of damaging the gearbox. Does This Get a Best Snow Blower Rating For 2013? In the Good, Better, Best rating system this snow blower rates a “Best” for ease of use, durability and long life. Power Steering, remote chute, electric start, large engine all factor into this “best” rating. It uses a strong Craftsman motor that has plenty of power for it’s 33 inch size. In fact the motor is one of the most dependable on the market today. The huge 16 in impeller and discharge chute move snow well and don’t clog when blowing wet, heavy snow. Is This One Of The Best Snow Blowers for the Money 2013? I normally don’t give you my opinion, but if you need a snow blower this large the price is the best of all the high-capacity units. Customer Satisfaction: Owners who knew what they were buying like this machine. It has virtually no mechanical issues. Value: At around $1800 it is a great value for the size. For less than 1/3 the price of a Honda snow blower you gets 90% of the capacity and features. You get many “creature comfort” features for the money with this snow blower. Service & Parts Availability: Service and parts are easily available at your home. Just call 1-800-4MY-HOME and Sears comes right to your home and repairs the snow thrower. If the service tech does not have the part with him, he can quickly order it while he is still at your house. The in-home repair is usually quicker than if you take another brand to a servicing dealer. If you want to service it yourself parts are readily available here Save 10% on your purchase at Sears PartsDirect.com (use coupon code 90055 for the discount) A 3 or 5 year protection plan is available that covers most wear and tear parts. labor. and trip charges. Ease Of Use: This is one of the easiest snow blowers to use because it has power steering and remote chute. It doesn’t matter if you are 5 ft, 100 lbs or 6 ft 300 lbs you will be able to easily operate this snow blower even though it is one of the heaviest snow throwers on the market. Heavy duty power steering makes this a breeze to use. The chute is the largest and doesn’t clog. Other features like good knobby tires, a headlight, heated handgrips and electric start make this snow blower a good choice. Housing a powerful 357cc engine, the Craftsman 33″ Dual-Stage Gas Snow Blower is designed to deliver maximum performance. A 33-inch clearing width and 22-inch intake height helps you clear more snow in less time. A 16-inch serrated steel auger pulls snow into a powerful 16-inch high-speed impeller that can discharge large volumes of heavy, wet snow. Tool-less drift cutters on this 33″ Dual-Stage Gas Snow Blower knife through hard-packed, icy snow drifts, making it easier to power your way through and efficiently clear them. In-dash LED headlights illuminate the clearing path and heated hand-grips keep your fingers comfortable on those windy and snowy days. With a two-year limited warranty, this brawny snow thrower is perfect for use during those wintry days.